Orders can only be cancelled in Brightpearl if no items have been marked as shipped, the order is unpaid and not invoiced. The order will also need to be cancelled in ekmPowershop. The order will also need to be cancelled in ekmPowershop. In Brightpearl, allocate a negative payment. This will mark the order as unpaid and reverse the sales receipt accounting. In Brightpearl, cancel the order. 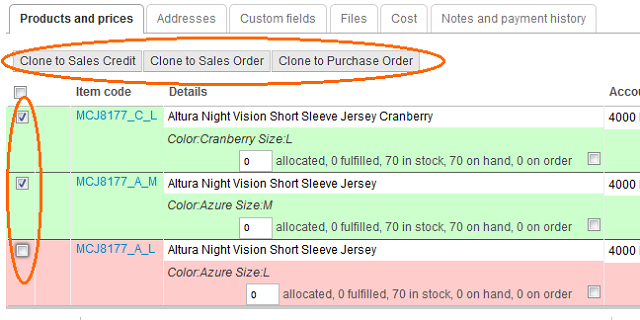 Move the order to the "cancelled" status to remove it from sales reports. Create the credit note only (click Credit), do not receive inventory on the credit, do not process a refund on the credit. In Brightpearl, complete the original order by shipping the items. In Brightpearl, clone the items on the order to a sales credit, receive the items back in, create the credit note and process the refund. In ekmPowershop, cancel the order and refund the money. In Brightpearl, leave the original order as unshipped. The reason you might choose option 1 over 2, is that the shipping status will be updated and the order will therefore no longer show up in "due to ship" sales order lists. It is not possible to move the order to the "cancelled" status as it has been marked as paid. The reason you might choose option 2 over 1, is that since the inventory is not removed and received back into inventory that FIFO costing is adhered to. However, since the order shipping status is not updated it will continue to show up in "due to ship" order lists.